NEW BPA Free Shatter-proof Plastic easy connect jar with handle. Aromatherapy, Herbal High Frequency Steamer Basket, and Ozone – Made For Tap Water. This machine allows you to treat your clients to an ancient healing practice, aromatherapy. This steamer comes equipped with an herbal basket so you can simply place fresh or dried herbs into a small satchel or a few drops of your desired oil or scent on a gauze pad, and insert into the basket. Steam passes through the herbs as it rises through the nozzle delivering wonderful fragrance and aromatherapy during treatment. To deliver the treatment the steamer heats distilled water to produce a high pressure steam for delivery to the skin. Included is an ozone function that sterilizes the steam as it passes through the steamer arm ensuring a clean, sterile treatment..
For your convenience, this unit is height adjustable with a 180 degree nozzle swivel with automatic low- water shut- off. The included timer emits no ticking sounds and has an automatic low-water shut-off. Magnifying Lamp – provides 5x magnification (16 Diopter) under a cool white light. The lens has a protective cover and is mounted on an adjustable stable arm for ease of use. Once set into position it provides magnification, light, and frees your hands in diagnosing skin conditions and performing extractions. Microdermabrasion – Of all of the methods used for skin exfoliation, microdermabrasion is the most effective for the surface of the skin. This is a mechanical process and does not use any chemicals. It is very effective in diminishing conditions left by sun damage, pigmentation, comedones, wrinkles, and coarsely textured skin. This is virtually a painless procedure; it is a safe and highly effective way to restore a clear, youthful glow to the skin. 1. Three operating wands to adapt to treatment needs. 3. Nine re-usable diamond tips of various sizes. Additional diamond tip sets available for purchase. The spray diffusers include 2 bottles with 2 color coded hoses. 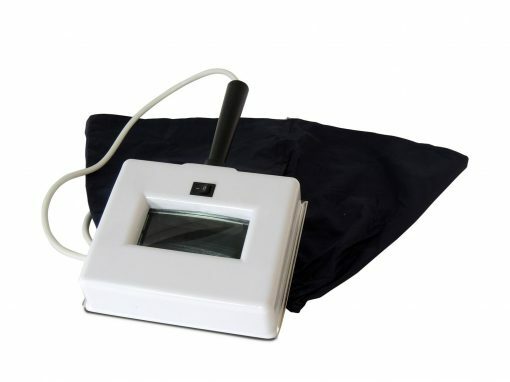 Galvanic – the Galvanic machine provides deep skin penetration to enable deep skin cleansing by utilizing both chemical (Disincrustation) and ionic (Iontophoresis) reactions. The galvanic treatment causes electrons to flow in one direction resulting in a relaxation response in the skin. Disincrustation is deep pore cleansing by dispersing the natural oils (sebum) which is beneficial for oily skin. Iontophoresis is the utilization of the electrons to more effectively penetrate water soluble solutions into the skin. Towels included. Hot Towel Warmer & Sterilizer – provide yourself and your clients with hot wet or dry towels providing a warm, soothing, and softening treatment to the skin. Use them to help remove facial masks and softening the skin before extractions. 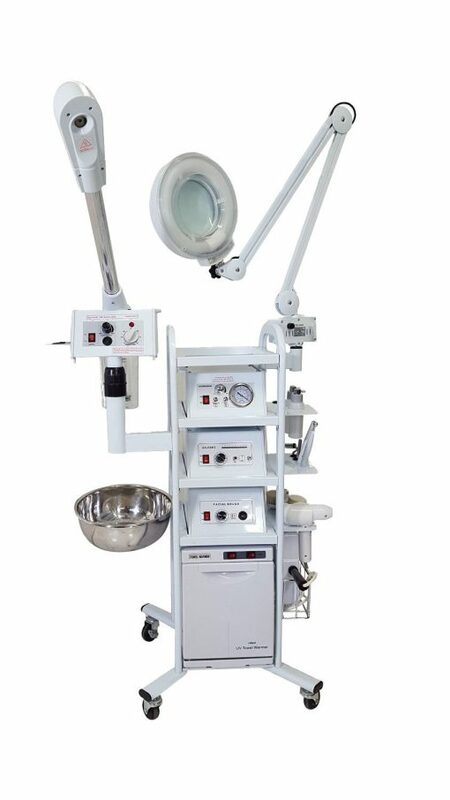 This unit comes with both heat and UV sterilization operated with separate controls (use one or both at the same time). The automatic temperature control keeps towels warm at ~176° F (80° C). It has a large towel capacity, a removable towel grill, and drip tray. Stainless Steel Utility Bowl– This Utility Bowl is easily attached and removed. It can be used to hold fresh water, discarded towels or most anything you want to use it for. Power Distribution System– Each mobile cart comes with a power distribution box providing excellent power cable management. All of the multi-function modules can plug into this power supply reducing the number of external power cables down to 1 required for the whole mobile cart. Tier 3 Cart – The mobile utility cart is made from heavy-duty rolled steel and rolls easily on commercial grade casters.